« David Mach is amazing. Let’s all be sure to mark Wednesday 19 September on our calendars with a big X. 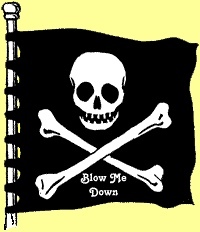 Because in case you didn’t already know, 19 September is officially International Talk Like A Pirate Day. Uh huh. 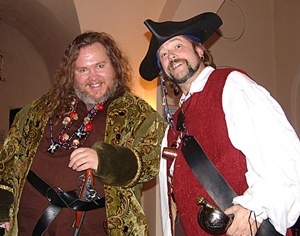 Apparently, this day began ten years ago, when John Baur and Mark Summers were playing racquetball in the US and started speaking to each other like pirates. No, they don’t know why, either. But they decided they were on to something and started to spread the word and encourage everyone to talk like a pirate on that day. It seems that it took off and was covered extensively by international media outlets, bloggers and scurvy dogs. Savvy? The boys called themselves Cap’n Slappy and Ol’ Chumbucket and started the Talk Like a Pirate website, which features everything you could possibly need to prepare for the big day – a shop, a translator, posters, songs, some craft activities and a link to a Pirate Name Generator. My pirate name is allegedly Dirty Anne Bonney, so I’m not sure how that works. Whatever you’re doing on 19 September, be sure to punctuate your everyday speech with an ‘ahoy there’ or an ‘aye aye, Cap’n’ or maybe even a ‘shiver me timbers’. I’m giving you plenty of notice so that you can check out all of the info you need here before you plan your festivities. Arrrrrrrrrr! My pirate name is Jelly Bones Suzy. I will be in Paris on International Talk Like a Pirate Day. I have absolutely no idea how to translate my pirate name into French. What’s a pirate to do? Ah, bon voyage, Jelly Bones Suzy! I am sure the French are big fans of this momentous day too, so stick with ‘arrr’, the international language of les pirates.